Swimming star Aimee Willmott led the University of East London (UEL) to its biggest ever medal haul at the British Universities and Colleges Sport (BUCS) National Championships in Sheffield by winning three individual gold medals and smashing two records. The UEL team finished the championships with 12 medals overall – five gold, three silver and four bronze – beating their previous record of 11 medals set in 2015. 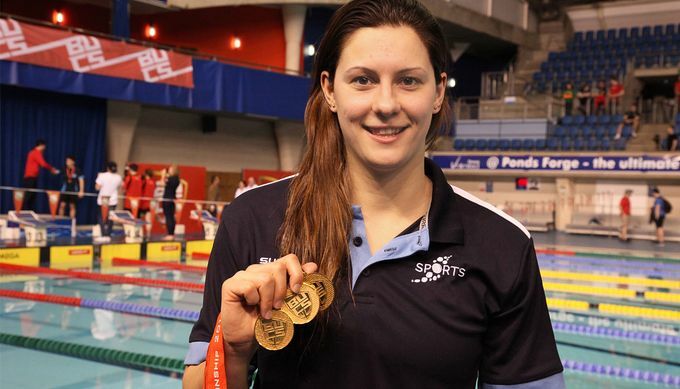 In-form Willmott, who is aiming to compete at her second Olympic Games in Rio de Janeiro this summer, claimed victory in the 800 metres freestyle, 400m individual medley and 200m backstroke, breaking BUCS records in the first two events. But it was her performance in her final race, in which blew away her competitors with a dominant swim in her non-specialist event, that came as the biggest surprise. Willmott was delighted with her overall performance – not just because she matched the three gold medals she won at the 2015 championships but because it bodes well for Rio preparations. Fellow swimmer Michael Gunning claimed two medals of his own, picking up two bronzes in the 200m and 400m freestyle events. There was triumph and despair on the track for sprinter Omololu Abiodun, who retained his 200m crown before pulling up injured in the 4x200m relay. Abiodun, who won the individual event in a time of 21.41 seconds, was joined on the 200m podium by Kyle Ennis, who claimed the bronze medal. It was the first time UEL have won two medals in the same event at the BUCS National Championships. But joy turned to misery in the relay. On the last leg of the race, Aboidun was on the shoulder of the leader from the University of Birmingham with 100 metres remaining when he pulled up with an injured hamstring. More medals came UEL’s way in the athletics arena as Corinne Humphreys shrugged off a hip injury to take silver in the 60m, while Thalosang Tshireletso leapt to a personal best 15.60m to claim second spot in the triple jump. The UEL judo team also had a superb championships, picking up a hat-trick of medals. Ghanaian Emmanuel Nartey was the star of the show, bringing home the gold, courtesy of an ippon, in the Under-81kg category final. This came after Nartey was earlier beaten in the round-robin stage. “That defeat focused my mind for the rest of the tournament,” he said. Julia Scardone, who had only just returned from a dislocated shoulder, missed out on gold by the narrowest of margins – a shido – in a tough fight against a fellow Team GB fighter. The third medal on the mat came courtesy of Umar Khalid, who took home the bronze medal in his first ever championships. UEL Director of Sport David Cosford could not conceal his delight at another incredible championships for the University.